The Ontario Ministry of the Environment and Climate Change (MOECC) recently issued an Order to the City of Mississauga (a City of 800,000 immediately west of Toronto) to remediate street sweeping it had distributed to a number of private and public enterprises as “clean fill”. Testing by the MOECC determine the street sweepings had high concentration of arsenic and other contaminants that could be deemed dangerous to human health. The events leading to the MOECC issuing the Order goes back to 2012. At that time the MOECC learned that the City of Mississauga had deposited Waste Street Sweepings as fill material on various properties located in southern Ontario. Mississauga conducts street cleaning each spring, with road sweeper trucks, to collect materials that may have accumulated over the winter. In 2012, The City of Mississauga indicated to the MOECC that between 2004 and 2011, waste street sweepings were eventually brought back to the Mississauga works yard on Mavis Road in Mississauga where they were deposited and accumulated. Prior to 2004, the City of Mississauga sent street sweepings to an approved landfill site. After 2004, the City of Mississauga informed the MOECC that it processed street sweepings by screening out debris, such as litter, and then deposited the material on properties including residential, commercial and agricultural properties upon the request of the owners of such properties. In February 2012, Mississauga provided to the Ministry a report dated June 20, 2011, prepared by a consultant to assist Mississauga “in determining disposal options for the material collected as street sweepings”. The report, based on the chemical testing of two samples collected on June 6, 2011 of street sweepings from Mississauga Mavis Work Yard, concluded that “Based on the chemical test results, in our opinion the subject material may be shipped to any registered landfill site licensed to receive this category of waste”. The report did not recommend sending the street sweepings to any other location or that the sampled street sweepings could be reused for any other purposes. In April 2012, during a meeting between staff from the MOECC and the City, municipal officials indicated it would dispose of its current street sweepings at an approved waste disposal site and investigate long-term options for the management of street sweepings. Mississauga initially disclosed to the Ministry that fifteen properties had received street sweepings between 2004 and 2011. In a letter dated October 22, 2012, lawyers from the MOECC restated the MOECC’s position that street sweepings are waste and should have been managed and disposed of accordingly. The letter also explained that street sweepings may also be managed as set out in the 1994 protocol “Management of Excess Materials in Road Construction and Maintenance“. In October 2012, after discussions with the MOECC, Mississauga retained a consultant, to carry out a site sensitivity analysis of the 15 properties that had been identified at that time to have received street sweepings. Based on the findings, in November 2012, Mississauga provided a letter to the MOECC proposing to assess the three most sensitive receiving sites out of the 15 properties. Based on the results of the soil testing at the two of the three sites (the owner of the third site did allow the City to access the site) the 937.5 tonnes of street sweepings had been deposited at one site and that there were contaminants of concern (mainly arsenic and lead) in the material. At the second site, it was determined that 67 tonnes of street sweepings have been deposited although City records showed that 1600 tonnes had been deposited. The analysis of samples at the second site showed that electrical conductivity measurements at levels that could present an unacceptable risk to plants and soil organisms. Further investigations and testing in 2015 by a second consultant hired by the City of Mississauga uncovered that there were at least 40 sites that had received street sweepings from the City. Moreover, only specific details and addresses were available for only two thirds of the sites. The City of Mississauga is appealing the Order on the grounds that street sweepings are not waste within the meaning of the Ontario Environmental Protection Act and the applicable regulations. As such, the MOECC has no jurisdiction to issue the Order. Moreover, in its appeal to the Ontario Environmental Review Tribunal (ERT) claims that the MOECC has not established that there are sufficient potential adverse effects, or any potential adverse effects at all, associated with the street sweepings to justify the work ordered. Finally, the City’s submission states that regardless on if the ERT finds that the street sweepings are “waste” and there are sufficient potential adverse effects from them to justify the Order, the work required is excessive, unnecessary, unreasonable and on advisable in the circumstances. “There is no risk to human health or the environment from the materials delivered” to the Cayuga site, Mississauga’s lawyer said in a 2016 corporate report. In the Order issued to the City of Mississauga, the MOECC details the steps required, in its view, for dealing with street sweepings. The MOECC believes the City should have hired a qualified consultant (typically an environmental engineer or geologist) as defined in the province’s Brownfields Regulation (O. Reg. 153/94) who then make a decision on what to do with the street sweepings in keeping with the MOECC publication entitled Soil, Ground Water and Sediment Standards for Use under Part XV.1 of the Environmental Protection Act (Clean-up Standards). The decision would be based on taking representative samples of the street sweepings, arranging for them to be analyzed and comparing the results to the Clean-up Standards. If analysis of the samples shows that the street sweepings meet the appropriate Clean-up Standard, then it can be treated as if it is excess fill and be used practically anywhere in the Province. If it does not meet the appropriate Clean-up standard, then is should be disposed of in a landfill or treated to remove contaminants prior to future use. The ERT Ruling on Mississauga’s appeal to the MOECC Order was stay some of the items of the Order and to dismiss the City’s request for a stay on other parts. In essence, the City needs to hire a qualified consultant and do further investigation. The information uncovered needs to be shared with the owners of the properties and the MOECC. There is, as of yet, not a determination on if the street sweepings must be dug up and transferred to a landfill. The Canadian Environmental Law Association, a not-for-profit non-government organization, recently made a submission to the Minister of Environment and Climate Change (MOECC) that makes recommendations on Canada’s position for the upcoming international meetings of Parties to key chemicals agreements to the Stockholm, Basel, and Rotterdam Conventions which takes place in later this month in Geneva, Switzerland. The Stockholm Convention is an international agreement that protects human health and the environment from persistent organic pollutants (POPs). The Basel Convention is an international agreement on the control of transboundary movements of hazardous wastes and their disposal. The Rotterdam Convention is an international agreement on shared responsibility and cooperative efforts in the international trade of certain hazardous chemicals in order to protect human health and the environment from harm. In the submission, CELA suggests that public engagement should be strengthened and that the federal Ministry of the Environment and Climate Change (ECCC) add additional substances to the limitation list. CELA further suggests that the ECCC commit to reviewing and reconsidering its position on pentachlorophenol (PCP), considering there are safe and economically viable non-chemical alternatives. Finally, CELA, urges the ECCC to take action on the listing of chrysotile asbestos during the international meetings. As reported in the Bismark Times, documentation prepared by the U.S. Pipeline and Hazardous Materials Safety Administration (PHMSA) shows that the regulator is of the view that the Belle Fourche Pipeline system is vulnerable to future spills due to the location of the pipeline in a landslide-prone area. 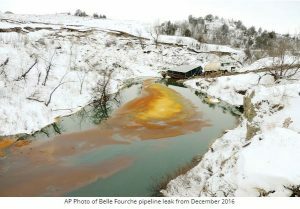 A spill in the pipeline back in December 2016 resulted in contamination of a tributary of the Little Missouri River. The cause of the spill is under investigation, but Belle Fourche Pipeline Co. (the owner of the pipeline) points to the slumping of a hillside in the rugged Badlands terrain where the pipeline break occurred. The PHMSA documentation on The Belle Fourche pipeline shows that the pipeline company may have experienced other spills in southwest North Dakota that went undetected due to inadequate leak detection monitoring and unstable terrain. The agency issued a corrective action order to Belle Fourche Pipeline Co. following the spill. 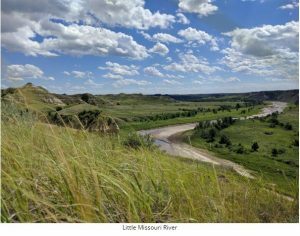 It was estimated that 529,830 gallons contaminated about 5 miles of Ash Coulee Creek, which flows into the Little Missouri River. Belle Fourche Pipeline Co. contested the corrective measures ordered by regulators and argued the spill was an “isolated, unpredictable event,” the document shows. However, after holding a hearing, the PHMSA concluded the pipeline system is potentially hazardous to life, property or the environment unless additional steps are taken, according to a document made public this week. The Office of Pipeline Safety, part of PHMSA, argued there is a risk of repeat failure on the pipeline system due to the topography of the area, soil conditions and slope stability issues. Federal regulators say significant questions remain about the cause of the pipeline failure and they upheld most of the corrective action items, including requiring the company to excavate and analyze the failed section of pipe and submit a root cause failure analysis. Regulators also ordered geotechnical evaluation of pipeline segments and a risk assessment of steep slope areas to determine if land movement could damage the pipeline. The segment of the pipeline that failed was shut down and can’t be restarted until the PHMSA allows it to restart. The pipeline system was built in the 1980s, but it’s believed a portion of the line near the failure was replaced in 2013, according to PHMSA documents. The North Dakota Department of Health has issued a notice to the pipeline company alleging violations of water quality standards and other state regulations. The agency has not yet decided on a fine. As reported in DurhamRegion.com (a Metro Media Publication), the federal environment ministry recently charged GFL Environmental Inc. and three of its employees for the illegal sale of tetrachloroethylene. The allegations contained in the indictment have not been proven in court. One of the employees charged by the Environment Canada and Climate Change (ECCC) includes the CEO and President of the company, Mr. Patrick Dovigi. Also, personal charges were laid against the company’s vice-president of sales and marketing, Mr. John Petlichkovski and another employee, Louie Servos. GFL Environmental Inc. is known as a North American provider of diversified environmental solutions, including solid waste management, liquid waste management and soil remediation. 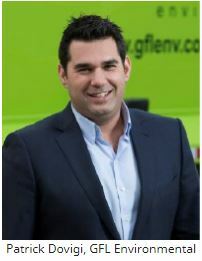 Its bright green trucks are easily recognized in the Greater Toronto Area (GTA) as it is a major private hauler of municipal solid waste in several GTA municipalities. Specific service of GFL includes collection, transport, processing, recycling and disposal of a broad range of hazardous and non-hazardous liquid wastes (plus sale of recycled liquid wastes and other liquid products). It is not known nor is it particularly relevant in the tetrachloroethylene sold by GFL was recycled. The ECCC alleges that GFL Environmental sold tetrachloroethylene, a solvent used in dry cleaning, to dry cleaning establishments that subsequently did not handle the material properly. The charges were laid under a section of the Canadian Environmental Protection Act, 1999 (CEPA) that prohibits the sale of tetrachloroethylene. The company and employees were charged under a section of the act that prohibits the sale of tetrachloroethylene (also known as “perc”) to operators of dry cleaning machines unless specific equipment and containment requirements in the regulations are met. ECCC alleges that GFL Environmental did not first determine that its customers had the required equipment before it sold them the perc. The federal Tetrachloroethylene (Use in Dry Cleaning and Reporting Requirements) Regulations (SOR/2003-79) under CEPA (Tetrachloroethylene Regulations)details the requirements for dry cleaners that use perc and also the requirements of companies that sell it. The regulations were put in place in 1979 as a means of requiring the use of more efficient dry-cleaning machines, minimizing spills of perc, and managing the collection and disposal of residues and wastewater. The reporting provisions in these Tetrachloroethylene Regulations apply to persons who import or recycle tetrachloroethylene for any use, to persons who sell tetrachloroethylene to dry cleaners, and to dry cleaners. This could affect how effective a purchase could be for a dry cleaner point of sale. According to DurhamRegion.com, GFL is vowing to fight the charges. “At GFL we take our environmental responsibilities seriously. We plan to vigorously defend these charges,” said a statement attributed to Ed Glavina, executive vice-president of strategic planning with GFL. The charges laid by ECCC allege that in 2013 and 2014 GFL sold tetrachloroethylene to nine dry cleaning operations in the Greater Toronto Area that had not adhered to containment measures required by Tetrachloroethylene Regulations. According to the indictment, infractions noted by enforcement officers included inadequate wastewater containment systems and floor drain plugs that were not resistant to perc. In some cases, inspectors found containers and pails of residue and sludge that were not equipped with secondary containment systems, the document indicates. DurhamRegion.com interviewed Rob McConnell, President of the Ontario Fabricare Association (OFA), as part of its investigation into the charges. OFA is a body of professional dry cleaners dedicated to the improvement of the fabricare industry in Ontario, through the establishment of good management, ethical conduct, top quality training and proper operating procedures. “Cleaners have a responsibility to observe those regulations, said Rob McConnell in an interview with DurhamRegion.com. “They should comply; it’s standard practice,” he said. According to the Open Chemistry Database, tetrachloroethylene is a colorless, volatile, nonflammable, liquid, chlorinated hydrocarbon with an ether-like odor that may emit toxic fumes of phosgene when exposed to sunlight or flames. Exposure to this substance irritates the upper respiratory tract and eyes and causes neurological effects as well as kidney and liver damage. Tetrachloroethylene is reasonably anticipated to be a human carcinogen. When released to the environment, perc can evaporate or contaminant the subsurface. Because perc is denser than water, it tends to sink through the subsurface and groundwater until it hits bedrock. It is also only slightly soluble in water. It is hence referred to as a dense, non-aqueous phase liquid (DNAPL). A property contaminated with perc is very difficult and expense to remediate. Sidney Chelsky, executive director of OFA told Durhamregion.com, “If an operator is following the regulations it’s safe for employees and it’s safe for the public. If a cleaner follows and obeys the laws, there’s absolutely no concern.” Mr. Chelsky said that while there is a dual onus for both cleaners and suppliers to ensure compliance with the Tetrachloroethylene Regulations, it’s typically the supplier that bears the brunt for infractions. Under the CEPA, penalties upon conviction can range from $15,000 to $2 million, and individuals can also face up to three years in prison. Pierre Manoni noted that none of the companies identified in the indictment related to the GFL case have been charged. Chelsky from the OFA said that ignorance of the law is no excuse for suppliers of tetrachloroethylene. The GFL case returns to court in Oshawa, Ontario April 21. Researchers from the Department of Biochemistry and Department of Chemistry at the University of Wisconsin – Madison recently published a paper in the journal Nature that claims to have solved the structure of a microbial enzyme that attacks toluene, a major subsurface contaminant. With the discovery of the enzyme structure, the researchers believe that they have an important tool in improving the microbial reactions that destroy organic contaminants in the soil and groundwater. The work is also valuable in that it provides a glimpse of the mechanics of a process that could be harnessed to help clean up oil spills. When bacteria carry out this transformation of toluene, they start a process that rapidly removes it from the environment. 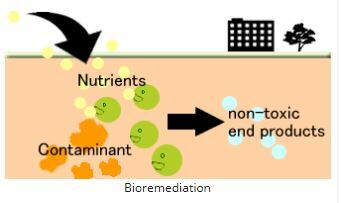 In this way, bacterial bioremediation is able to remove harmful substances from the environment, something scientists are already taking advantage of to help ecosystems recover from chemical catastrophes like oil spills. At the end of December, 2016, the Ministry of Environment and Climate Change (“MOECC”) in Ontario released its Excess Soil Policy Framework. The problem of excess soil is not a small one, and it has been gaining more attention, particularly as big cities seek to intensify, creating vast quantities of “fill” that then has to go somewhere. Clarington (east of Toronto) banned it from coming to its town completely. Residents in the Town of Erin and Wellington County (northwest of Toronto) have established a website to bring attention to their town’s plight in having to deal with this unwanted excavated material. The failure to manage these soils properly impacts ground and surface water, natural areas, and agricultural lands. It also causes serious nuisances to receiving communities in the form of dust, track traffic, road damage, erosion, drainage and other social, health and environmental problems. As the Framework also notes, it has implications for greenhouse gas emissions, as thousands of trucks annual move soil around the province. 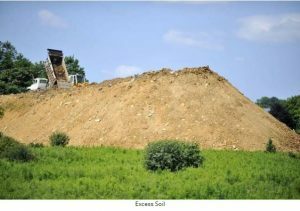 Municipalities are key players in managing receiving sites and it’s become imperative that municipalities have tools in place to regulate excess soil through their site-alteration bylaws. Currently, there is great variance between how individual municipal by-laws define soil quality, if it’s defined at all. Some bylaws address nuisance issues, while others do not. Under the Framework, the Ministry of Municipal Affairs and Housing (“Municipal Affairs”) is to play a greater role in supporting by-law development, land use and development planning. Similarly, Municipal Affairs and the MOECC will work with municipalities to identify local reuse opportunities and suitable temporary sites. Protecting sensitive areas of provincial and local interest, including natural heritage and hydrologic features and functions, farmland and archaeological resources, and significant built heritage and cultural heritage landscapes. A major change, which will require new legislative tools, is that source sites will have new obligations in the development of excess soil management plans, identification of appropriate receiving sites, arrangement of proper contracts, and the registration and tracking of excess soil to the receiving sites. They will have to hire Qualified Persons to develop the soil management plans. The province will now be taking steps to fill regulatory gaps and establish clearer roles for a number of ministries, including Infrastructure, Transportation, Natural Resources and Forestry, and Agricultural, Food and Rural Affairs. This is indeed a major overhaul of the regulatory framework that seems overdue. Since start ing her practice in 2001, Paula has combined her Masters of Biology with her specialization in environmental law from the Schulich School of Law at Dalhousie University to provide her clients with top notch environmental legal advice. She has serviced corporate, non-profit and municipal clients, giving her a diverse perspective on the complex environmental issues that our laws and policies seek to address. Paula has provided opinions on a variety of environmental legal issues, ranging from municipal by-law powers to obligations under various environmental statutes. As a litigator, she has practiced before various administrative tribunals, in the provincial and superior courts, and at all appellate level courts including the Supreme Court of Canada. This article was first published on the Siskinds Law LLP web site. Information regarding the dates, time and location of the examination will be posted on the CSAP Society website. Videotel™, part of KVH Industries, offers a comprehensive training package designed to enable sail ship crew and shipping office staff to become familiar with the rules governing the carriage of hazardous materials. These rules are specified in the U.S. Code of Federal Regulations, Subchapter C of 49 CFR; in the International Maritime Dangerous Goods (IMDG) Code produced by the IMO; and, in the relevant parts of Section B-V/c of the STCW Code. It is estimated that 10 guided learning hours are required to complete the 15-module course, which is designed to be used onboard or ashore for individual self-study. Supplied in an interactive, computer-based training format, the “HAZMAT Training Course” enables participants to follow easy on-screen instructions to progress through the course, which contains a mix of still photographs, video clips, and animation.